This painting highlights notable businesses and the Orlando City Hall located in Downtown Orlando, Florida in 1951. 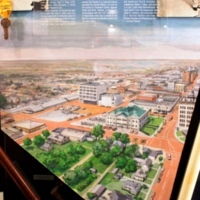 Featured in the piece is South Street and the South West Corner of Boone Street. At the center of the piece is the Orlando City Hall which was constructed in 1906 originally to serve as the Orlando Public School. On the right is the headquarters of the American Fire and Casualty Company, which is the only distinguishable business in the piece. In 1951, visitors would have seen many flourishing businesses such as Howard's Grocery Company, Borden Dairy, Orlando Linen Service, as well as the Dixie Sales and Service Garage. The piece was painted by artist Jim Stoll in conjunction with Orlando Remembered. Original oil painting by Jim Stoll: Orlando Remembered Exhibit, Orlando City Hall, Orlando, Florida. Originally created by Jim Stoll. Dickinson, Joy Wallace. Orlando: City of Dreams. Charleston, SC: Arcadia Pub., 2003. American First & Casualty Company; B. & J. Service Station; Billy Beardall; Blair Howard; Bob Carr; Boone Street; Borden's Dairy; Burwell Howard; city halls; Court Street; Dixie Kuhr; Dixie Sales & Service; Doc Estees; Don Mott; Downtown Orlando; Enzor's Pharmacy; Eugene Goodman Duckworth; Fidelity Storage and Warehouse Company; George Wolfe; Harold Wilson; Howard Grocery Company; J. Rolfe Davis; Jack Cranis; Jack Delbert Agnew; Jackson Street; James LeRoy Giles; Jim Stoll; Joe Croy; Julian Howard; Latta M. Autrey; Little Red Schoolhouse; May Billy Beardall; mayors; McElroy Apartments; OPD; Orange Avenue; orlando; Orlando City Hall; Orlando City Jail; Orlando Linen Service; Orlando Police Department; Ormund Powers; Robert Spencer Carr; Samuel Yulee Way; South Street; Theodore Carter; V. W. Estees; Verner Wilson Estes; W. W. Yothers; Walter L. Hays; William Hamer Beardall, Jr.
Stoll, Jim. “Orlando City Hall Exhibit Painting.” RICHES of Central Florida accessed April 23, 2019, https://richesmi.cah.ucf.edu/omeka/items/show/7871.